The yacht left Marina di Ravenna harbour in uncertain conditions. The boat had completed some refitting at a boatyard at the marina days before. That same day the boatyard manager was supposed to ferry a sailboat somewhere along the coast, but he quickly changed his mind when the first gusts hit. He then called the skipper of the damaged boat, which had already set sail, to try and convince him to turn back. He answered that he was experiencing rather rough conditions but he expected the wind to abate in the next three hours so he was comfortable to press on. The skipper later contacted Rimini harbour, asking for a berth. He was relaxed and even joked with the harbourmaster, whom he had met before. The harbourmaster assigned the sailboat a berth, and a man tasked with assisting the yacht in berthing followed its approach to the harbour entrance. He said that the vessel was proceeding without apparent problems and was about to enter when the engine stopped working. The crew then tried to raise a sail but a very steep 5 meter wave picked the boat and smashed it against the break water. The day of the accident a low pressure system was rapidly transiting over northern Italy. Strong northerly winds had been forecast. The yacht was heading south in would have been a swift reach along the eastern coast of Italy, by all means a lee shore. The “bora” northeasterly wind is well known and respected by all those who sail the Adriatic sea. It can set suddenly with gusts reaching F11 that create a very short and steep sea. Later that evening two ferry boats from Greece heaved to outside Ancona harbour for two hours waiting for the conditions to improve. The skipper was a 68 year old retired professional. At least one of the crew, a 64 year old who also perished, was experienced, having just completed a RTW cruise on another boat. Of the two survivors, one, a 39 year old man, was found unscathed inside the boat, the other, a 68 year old man, was picked from the water one hour later, hypotermic but is now rapidly recovering in hospital. And Mauro Melandri, Publisher of Zerogradinord, summarizes more reports (edited) with photos here. The boat is a Bavaria 50 Cruiser, registered under Monfalcone (ITA) Port Authority, usually moored in Marina di Ravenna, named Dipiù. Italian Coast Guard, the morning after the event, reports four victims: E.M. (69), who completed a circumnavigation some years ago, A.F. (67), co-owner of the boat, his daughter A.F. (38), the first who fell overboard according with survivor description of the facts, and E.S. Two men – L.N. and C.C. – were recovered few moments after the event and lifted to the hospital in serious condition. C.C. is in recovery room. Official investigation is underway, but it seems that the boat, with six crew members, most of them coming from Verona (Veneto, ITA), was sailing from Marina di Ravenna (Emilia-Romagna, ITA) to Trapani (Sicily, ITA) when, just after 40 nm, the crew opted to repair in Rimini harbour to the severe worsening of the weather conditions. According with media info, the engine went out of service and the crew had no time to set sails so the boat grounded hard on the main harbour jetty, close to the famous Rock Island bar, losing the keel and after few minutes was capsized and dismasted by the imposing waves. 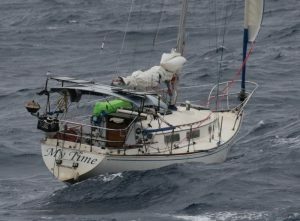 From the picture where the boat has still the mast, it seems that the crew deployed the staysail as ultimate attempt to avoid the impact. At the sunset, Coast Guard, Fire Department and all the other law enforcements, whose intervention activated by some observers was timely, were still looking for the survivors, using also two helicopters. They found the bodies of the victims early the morning after the event close to the destroyed hull of the boat. Having come to know about the loss of the four crew members, Michele Capra, friend of the owner and Bavaria dealer in the harbor of Marina di Ravenna released a few declarations. He said he met the crew yesterday, since Dipiú was moored next to a boat that Capra had to move to a close shipyard, transfer that eventually he didn’t do because of the extremely adverse weather conditions. He said he advised the crew not to leave, being answered that weather forecasts were advers just for few hours, and the six left Marinara Harbor. When gusts became even stronger, Capra called A.F., owner of the boat, who said: “There are big waves and we are already a few miles away from Ravenna. Weather should be improving so we are going to go on”. “I should have done more to convince them – Capra regrets.